Based on my current knowledge, light increases the saturation of a color. If that's the case, then the form shadow of an object should have lower saturation than the part of the object hit by light (not the highlight; just the part of the object that's between the highlight and terminator). However, after studying both traditional and digital artists' works, I noticed that many people increase the saturation in the shadows and decrease it in the light. Why is that done? Are they simply using artistic license because they don't want to lose color in the shadows? Let's take a look at a photo of a colored object. 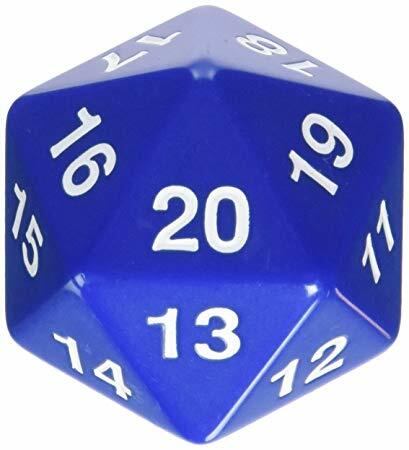 This is a simple, bright blue 20-sided die. I picked this because the shape and lighting make it easy to see multiple levels of brightness. I then took this image and imported it into Adobe Color Wheel, which has quickly become one of my favorite tools for analyzing palettes when I don't have access to an art program. I find digital tools are a great supplement for learning traditional art skills, especially when you're teaching yourself. In this case, looking at the actually HSB number, we can see the shadow is actually slightly less saturated than the midtones, but the caveat here is that it's based on the pixel selected for that color. Picking different pixels from the "15" side in the shadow yield slight differences in saturation, and mainly it's on-par with the midtones. But, as you've observed in artworks, the highlighted sides (17, 18), have decreased in saturation. Why is that? The way that light and objects interact is inverted from what we actually see. So a bright blue object like this, which is almost completely blue, actually reflects Blue light back to our eyes. The object itself is absorbing Red and Green light (when basing this on the RGB color scale, which is what visible light is based on). When you shine white light onto an object, you're essentially shining all colors onto that object (the dice, here). The shadows, receiving less light, will still absorb the Red and Green light, reflecting back lower amounts of Blue light. Because the amount of light is reduced, the brightness value on the HSB (Hue/Saturation/Brightness) scale with be lower, but the Hue and Saturation stay essentially the same. Since the light being reflected back is no longer pure Blue, the saturation decreases. This is because saturation (colorfulness, chroma, intensity, etc) is measured by the difference in the levels of color from gray, or in other words the difference in the dominant hue(s) from the remaining hue(s). This also explains why shadows of a form still often maintain the same level of saturation: the dice has no problem absorbing the meager amount of Red and Green being cast on it. Although, in this case, the object does absorb some Blue, so at low enough levels, we might see the saturation decrease, because proportion of reflected Blue light is lower. Note that all this is mostly the theoretical application of light as it would apply to art. Rarely is a subject going to be lit from a single, clear, diffuse white light. Most environments are going to have multiple light sources, often not pure, and you'll be dealing with reflection of colored light off nearby objects. That's when the artistic eye and choices really come into play. Not the answer you're looking for? Browse other questions tagged painting color or ask your own question. When working in a visual medium, how do I avoid incorrect color? Reliably identify the local color of a subject in non-white light? How to make abstract /marbled designs on a paper? What range of wall color options would be generally considered aesthetically viable for a room with colored light bulbs? How to make a skin or golden color in nail paint? How can the colour scheme of this painting be described (in technical terms)?